The truth is that manufacturers of commercial cleaning products play on our fears of hygiene issues by convincing us that we need the latest and greatest spray that miraculously “kills 99.9% of bacteria” in our home. Umm, excuse me?!? 99.9% of bacteria? No thank you! 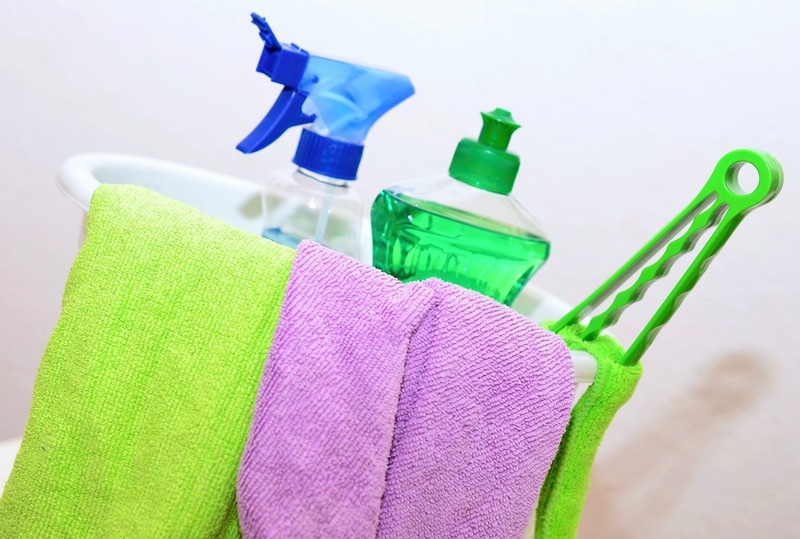 The introduction and widespread use of anti-bacterial products for home use has inevitably led to drug-resistant bacteria. That’s right, bacteria that has mutated and become completely immune to antibiotics. Not only that, but these products also kill the good bacteria that are supposed to keep the bad bacteria under control. Of course, anti-bacterial products have their place in society; they were originally used exclusively in hospitals and other healthcare settings, where risk of infection is very high. However, now that they’ve made their way into ordinary households, their use and overuse is doing much more harm than good. 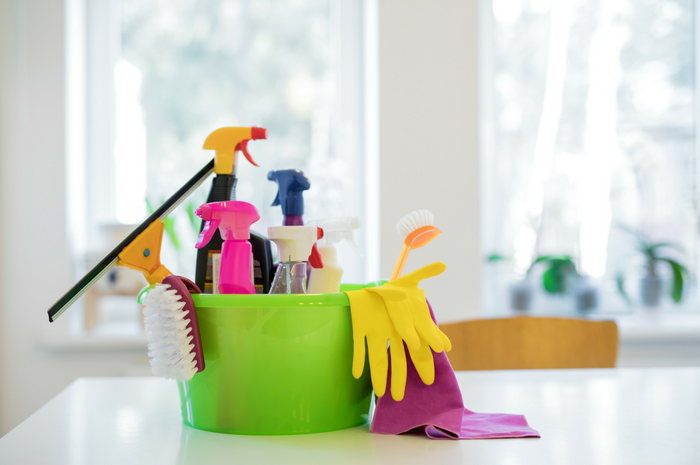 Lysol is a popular brand of antibacterial spray and I’d venture to guess that your kitchen or bathrooms have been graced with its presence at one point or another. In reality, sprays like Lysol are very hazardous to our health. 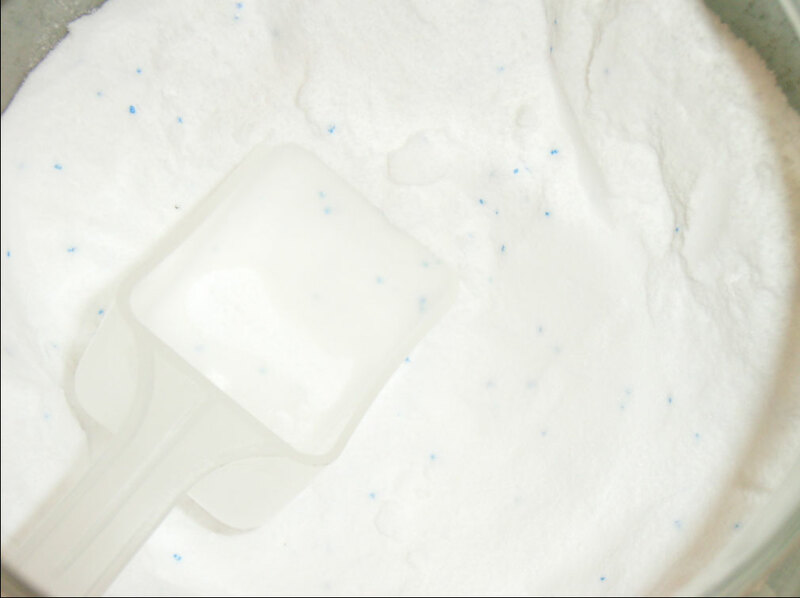 They contain ingredients like formaldehyde, hydrochloric acid, and phenylphenol – a skin, respiratory and mucous membrane irritant, according to the CDC. 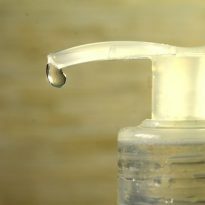 Good old soap and water is just as effective at killing germs – and it’s cheaper, less hazardous, and doesn’t require the use of protective gloves or safety goggles. Make sure you use 100% pure essential oils (NOT just scented oils). You can find essential oils at your local health food store, or you can purchase them online from Amazon or Mountain Rose Herbs. Below is the recipe that I’ve formulated, but feel free to play around with it to suit your own needs. Some find the strong scent of eucalyptus oil to be a bit strong, so you may want to decrease the amount you use in your spray (or eliminate it completely). The tea tree oil is a big player in this recipe, so don’t leave it out. NOTE: The bottle that’s in the picture is a plastic bottle. Ideally, we should be using glass bottles when working with essential oils (or any oils, really!) because the oils can break down the plastic over time. Mountain Rose Herbs carries some great glass bottles and spray pumps (misters) that I’ll be ordering very soon! 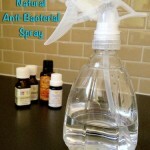 DIY "anti-bacterial" spray for countertops and other surfaces, made with the power of essential oils. 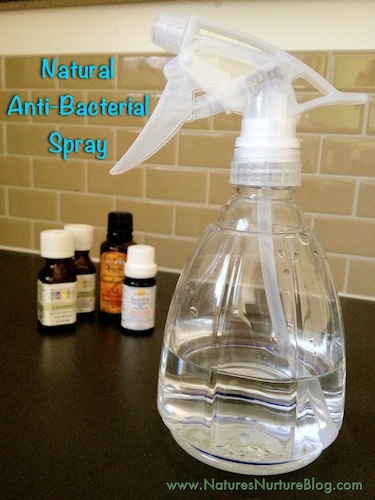 Add witch hazel to 8 oz spray bottle. Add essential oils, and swirl to combine. Fill with water until about 1/2" from the top. 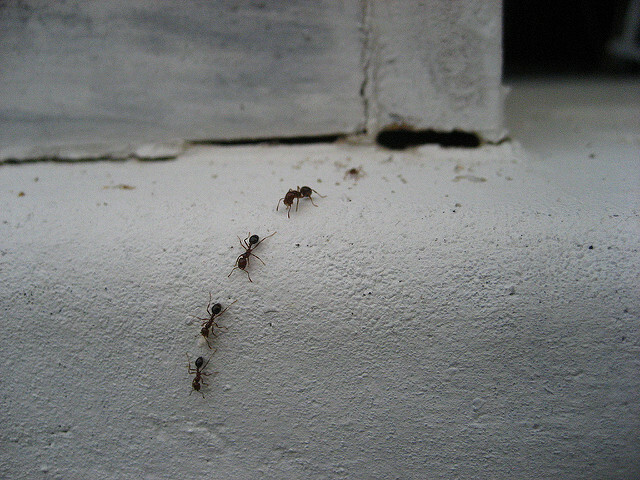 Spray on countertops and other hard surfaces and let air-dry. What if I do not have eithch hazel? Can I make the spray w/o it? You can try rubbing alcohol. Is this safe to use on oak worktops? I’m sorry Kerry, I’m not sure. I would run the ingredients by the manufacturer and check with them maybe? Is this disinfectant OK to use on granite? I believe the witch hazel in this recipe make it a bit acidic, which isn’t good for granite. You could try replacing the witch hazel with rubbing alcohol (also called isopropyl alcohol or surgical spirits). Is this safe to use on quartz counters? From what I understand about quartz, it seems like a pretty tough, non-porous surface. So I don’t see any reason that this wouldn’t be safe to use, but of course the safest advice would be to check with the manufacturer. May I assume the above recipe works on nursery room toys also? If there is a better combo, would you please share? I see so many different combinations depending on what is being cleaned. Teresa, for nursery room toys, honestly it’s much easier to use some hydrogen peroxide. Either spray it on directly, wipe them down with a rag that’s been sprayed with it, or just soak them in a sink full of water and some peroxide. That last one might be too diluted depending on what exactly you’re trying to disinfect for, so use your judgment. We buy a lot of second hand toys and baby stuff, and I found that this is the easiest and most effective way to disinfect them. Best of luck! How much Hydrogen Peroxide do you put in a sink full of water? Honestly, I’m not sure I can give a straight answer for this, because it would get too diluted. I mentioned it as an option, but what we’ve usually done is just spray it directly on the toys, and let it sit for at least 5-10 minutes. The article says this spray is good for hard surfaces. What would you recommend for soft surfaces such as a bed? I spray my mattresses with lysol when changing the sheets. What natural spray would be better? I’ve totally used this on soft surfaces as well. 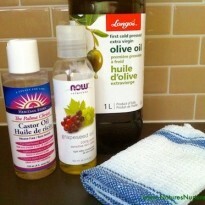 You could also try adding some witch hazel to help it evaporate and disperse better. My cat may have ringworm (not confirmed yet) I definitely do not want to use bleach to disinfect my whole house. Do you think this will kill off ringworm spores? Honestly, I’m not sure at all. You may want to do a google search for ringworm and essential oils to get a better idea of which oils, if any, can kill of the spores. Good luck! I’m doing the same thing too! Do you use the sweet or bitter essential oil in your spray? Is there are difference in smell/use! Thanks! If you’re talking about the orange, I use sweet orange oil. 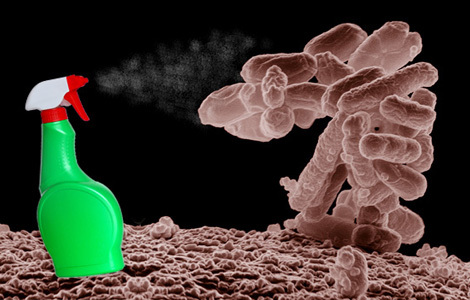 Could a spray like this work as antibacterial spray for sports equipment. I currently use febreeze antibacterial, but I would like to use a chemical free product going forward since I sweat with this stuff on. I would totally use this on sports equipment! 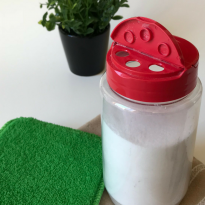 I’ve recently been trying to go the all natural route and making my own cleaning and beauty supplies and I had a quick question about your spray…. After you spray it on your hard surfaces do you wipe it with a clean cloth or just let it sit and air dry? Thanks for your post!! That’s a great question! I usually just let it air dry. But sometimes I need a surface to be dry right away so I can use it again so in that case, I’ve wiped it up with a cloth. Either way is fine, Just be sure to give it a good shake before spraying to help the oils mix with the water. Would like a spray for fabric. Furniture and mattresses. Can you help? I found a couple recipes online that look promising. Let me know if you try them out and how they work! Is this safe (non-irritating) to use on people (i.e. underarms, groin, etc)? Hi TJ, I’ve actually used this to spray on myself both over my clothes and as a quick spritz right after I’ve gotten out of the shower and I love it! Essential oils are mostly safe to use topically if they are diluted in either a carrier oil (like olive or coconut oil, etc.) or in water (like in this spray). If using as an all-over-body type of spray, you may also want to try using either distilled water or witch hazel, in place of the water. Thanks for this DIY. 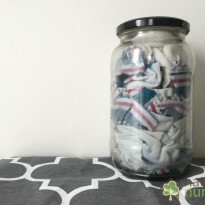 I’ve got making more of my own cleaning supplies on my summer bucket list. Hi Sarah– Just wanted to let you know that you get credit for turning another ignorant fool (me) into a green domestic goddess! 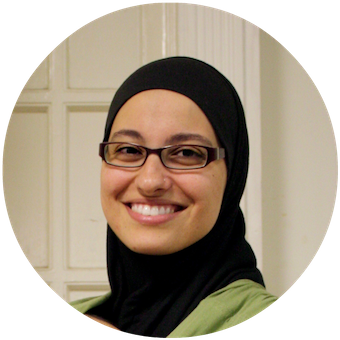 🙂 I love your site and have referred many friends to it as well in hopes of spreading the knowledge (and the love!) However, being new to all of this, I have encountered an issue…..I purchased some tea tree essential oil at a local shop, but I have some issue with only adding in a drop or two, as it is in a glass twist cap bottle (and it’s only 2oz., so the opening is rather small) so when I was adding it to my solution it didn’t “drop” out, but it sure made a mess! any suggestion to a clueless one such as my self as to how to prevent this? Thanks! If yours doesn’t look like that, then you got a defective bottle and should go back and exchange it. If it does look like that, then maybe the plastic piece is a little loose and just needs to be pushed in more? Awesome! I still have never invested in essential oils, but I know that there are amazing things you can do with them. Thanks for the recipe! Thank you for sharing! I’ve felt this way about “anti-bacterial” for a while but didn’t know any alternatives. Pinning as well. Great post! I use essential oils quite a bit and have been looking for a recipe like this. There are so many out there. I think I have everything, so I’ll have to give it a try. I grew up outside of the U.S. and the running joke among my family is that kids back home don’t get sick because we let them eat a little bit of dirt from time to time. But there is some truth to it. We are making our kids’ immune system weak by killing “99.9%” of bacteria. Great post Sarah! Thanks! Glad you like it, Stephanie! You’re absolutely right about eating dirt though! My 13 month old actually did this a few weeks ago, and aside from washing out his mouth and hands with water, that was it really. There was no freaking out that he ate germs or anything like that. Eating and playing in dirt is just a normal kid thing to do – we have to let them live a little so they exposed to the less harmful things, in order to strengthen their bodies to fight off the stronger diseases later on! It’s all truth that. Letting kids or adults get sick and having nature take its coarse trains the B-cells very well which are the building blocks to our immune system. People mainly are just . I used to get sick a lot, sometimes it lasted over a month and a half. It’s been well over 3 years and nothing even when closly conversing with sick friends. All I remember maybe is just a 33 hours more or so of a fever, 3000 milligrams of vitamin C to boost immunity, 3000 milligrams of Acetaminophen to reduce the fever spread over the coarse, then healthy again like a horse. That’s 33 hours sick with no symptoms other than fever in 3 years and counting. I’d say that’s bionic. 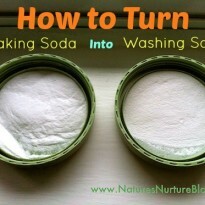 And thanks for the recipe, I’d try maybe adding some borax to that and experiment more. Life is so simple once you free your mind from all the lies and unethical marketing hypes. 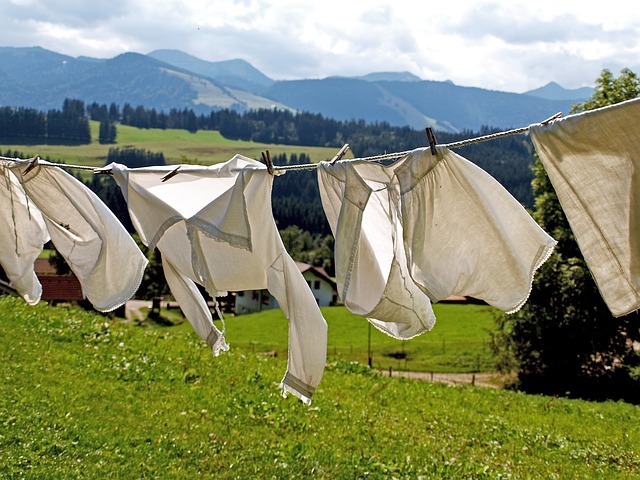 People need to get back to nature in every aspect of life, not only in cleaning. I was placed on antibiotics to clear up an infection—which caused a different infection and because of the second antibiotic all my good bacteria were also wiped out and I can down with a terrible case of throat and esophageal thrush. The dr wanted to give me more medicine. Instead I took one drop of tea tree oil and the next morning, the thrush was gone. If you want to get the best, purest essential oils that are free from alduteration go to http://www.doterra.com. You won’t regret it. I love this! Yes, I agree with Sonja. 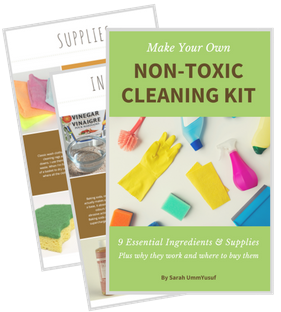 Advertising has led people to believe they need those toxic cleaners when they are so not necessary. It’s ridiculous, isn’t it, Kendra?! When we realize everyday that more and more of the products we bring into our homes don’t even need to be there in the first place! Our society needs to start going the other way, and use natural products. It is frustrating how deceived our society is by big companies, and we have to move the other way. Thanks for the post! Indeed, Sonja! We really need to take the developments of modern day and make them work WITH the wisdom of the past, instead of working against it. I still can’t believe how much of the products we bring into our home are not even necessary! Thank you Sarah. Very good information.